Akira Takarada is instantly recognizable to generations of moviegoers around the world as the face of Japan's long-running series of Godzilla films from Toho Studios. 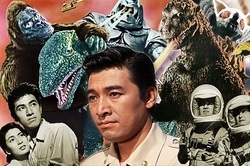 With a career greater than the King of Monsters himself, Takarada has been there from the birth of Godzilla, through many key points in the franchise's history, including the Golden Era of Japanese cinema. Fresh out of high school, Takarada joined Toho's "New Face" program in 1953, and just one year later, would be given the starring role of Hideto Ogata in the original Gojira, appearing together with renowned Kurosawa film star Takashi Shimura, and classmate Momoko Kôchi portraying his character's love interest. Takarada and Kôchi would reprise similar roles in Toho's Abominable Snowman (1955), better known in its truncated Americanized form, Half Human (1958). But it was the breakout success of Gojira which led to its being exported worldwide as Godzilla, King of the Monsters in 1956, with Takarada subsequently cast as the romantic lead in many feature films, thus earning him the endearing nickname "Mr. Handsome." It wasn't until nearly 10 years later that Takarada would return to fighting giant monsters at the start of Godzilla's worldwide rise to superstardom with Mothra vs. Godzilla (1964). Portraying a brash yet heroic news reporter, it was this role that would epitomize that type of character that Takarada would become best known for as Japanese cinema, and giant monster films in particular, peaked in popularity at the outset of the mid-1960s "kaiju boom." Takarada also became famous closer to home for his comedic flair through roles such as super spy Hoshino Andrew in the 007 spoof, 100 Shot 100 Killed (Ironfinger, 1965), together with Toho starlet and future Bond girl Mie Hama. The 1970s and the decline of the motion picture industry in Japan due to the increasing popularity of television saw Takarada leaving feature films for the stage, where his stellar work in musicals became widely known--an area where he continues performing to this day. He returned to motion pictures more than a decade later, eventually appearing in Godzilla vs. Mothra (1992) and 2004's Godzilla Final Wars, which was the 50th anniversary offering from Toho and the last film in the famous franchise to be produced by the studio. Takarada's career came full circle with the 2014 release of Legendary Pictures' Godzilla as the only star from the original 1954 film to make a cameo appearance in the mega-budget Hollywood reboot of the world's most famous monster franchise.